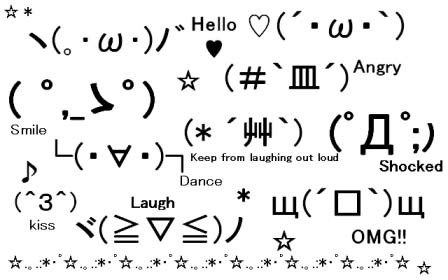 Many Japanese people love to use emoticons, kaomoji, on their cell phones or computers! Because emoticons are so popular, they are used in manga too. It means that most of the readers understand the kaomoji but the people outside of Japan might be confused with the strange faces. Just know that kaomoji are horizontal! Smile(^_^), Laugh(^ o ^), Wink(^_-), Shy(*^_^*), Blushed(#^_^#), Cry(T_T), Cry(T o T), Lost(*_*),Confused(@_@), Sorry(prostrating) m( _ _ )m.
Since hiragana, katakana and kanji can be used to create faces, the variations of kaomoji are numberless.